An older pic of mike since I didn't take a photo of him at the signing. Many signings were taking place this Saturday. Most were starting about the same time. If I post every detail from the signings, it would eventually bore you. I will make it quick and simple. It's been a really long day. 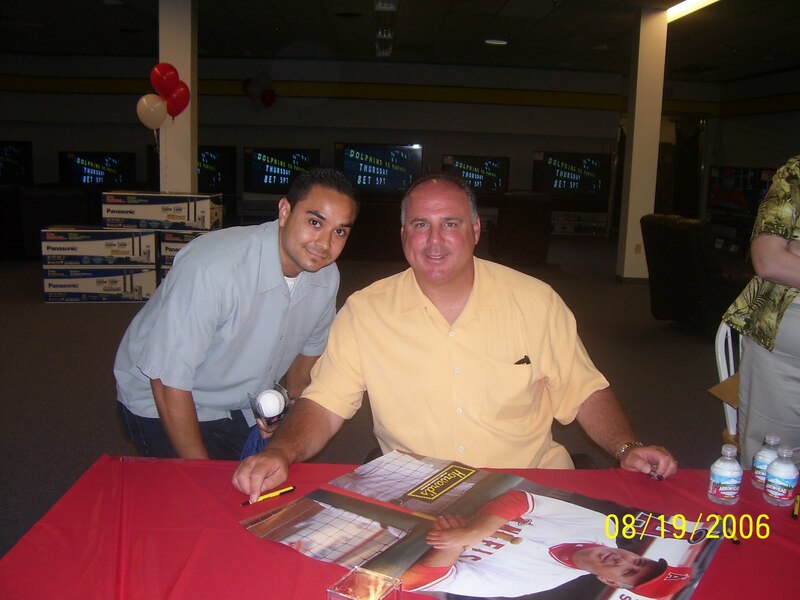 Mike Scioscia and Howie Kendrick were signing at Howard's Appliance in Laguna Hills. People in line? I would guess over 300. Items per person? 1 item. Mike and Howie turned down many people wanting a second item. Giveaways? Howard's backpacks and Mike Scioscia bust statue. Note: Howie Kendrick changed his signature. Before he would just scribble. Now you can actually read his name. His signature is a lot better now. After the Howard's event our carpool headed out to Living Spaces in Irvine for a Juan Rivera signing. I have never been to a signing at Living Spaces with almost nobody in line. Juan was pretty much by himself when my group arrived. People in line? About 5 people. That's why a posed photo was not a problem. Items per person? 1 item but with a chance to get back in line. After the Juan Rivera signing we headed out to Ladera Ranch for Angels infielder Erick Aybar. People in line? About 200 people. I'm sure it was a lot more people since we arrived after the signing had started. Giveaways? Game tickets and Angels posters. After the Aybar event we then headed over to the city of Orange for a Maicer Izturis signing. When we arrived he had already left. It still worked out good for us. 3 signings in one day isn't bad. I would like to thank all the people that made these free events happen. Howard's Appliance, at&t and Living Spaces.